Marmaduke DURHAM was born in 1786/1787 in Aysgarth and was christened 25 Dec 1797 aged 11 in Aysgarth, Yorkshire, England. He died on 11 Oct 1877 and was buried on 13 Oct 1877 in St Andrew's, Aysgarth [B300]. Marmaduke married Margaret ROUTH, daughter of William ROUTH and Margaret, on 12 Jan 1808 in Aysgarth. Margaret was born in 1783/1785 in Aysgarth and was christened on 16 Jan 1785 in Aysgarth. She died on 19 Nov 1869 and was buried in St Andrew's, Aysgarth [B300]. Marmaduke DURHAM was illegitimate. His father is unknown and his mother was Elizabeth DURHAM, who was born before 30 Mar 1760 in Aysgarth and was christened on 30 Mar 1760 in Aysgarth. 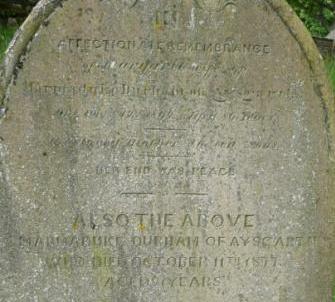 She died in Dec 1815 in Aysgarth and was buried on 12 Dec 1815 in Aysgarth.